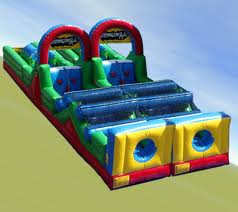 Obstacle course rentals are a fun and challenging addition to any party. The adrenaline rush obstacle course is the largest and most popular with schools, colleges, and graduation parties. This challenging obstacle course has crawl through tubes, pop up obstacles, a rock climb and then a slide for the finish. The older kids love competing and racing their friends. The Double Rush obstacle course rental is the two outside pieces of the adrenaline rush for a more budget friendly rental for an older kid. The Backyard Obstacle Course is popular with the younger kids, it has crawl through tubes, pop up obstacles, and a rock climb and slide. An obstacle course rental is a great choice for a church or school event as it is easy to supervise because two kids go through at a time. The Octagon extreme rental is great as an extra large bounce house rental with two built in soccer goals and two basketball hoops. The Octagon provides hours of bouncy sports fun. Add on the jousting option and it becomes a popular joust rental for high school graduation. They will love using the joust poles to try to knock each other off the pedestals. Or add on the boxing option and try out your skills in the bouncy boxing arena!